It’s the beginning of the holiday season and all the traditional eats are right around the corner. If you’re traveling and volunteered (or were volunteered by someone else) to bring your best dish, did you consider what the travel time can do to your recipe? Or whether there will be room in the oven to cook or reheat your tasty tidbits once you arrive? Don’t let holiday travel throw a wrench into what might otherwise be described as nothing short of divine. A tweak here and there may be all your favorite recipe needs. For example, if a hard brake on the way to last year’s family gathering sent your infamous cherry pie toward destinations unknown, leaving you to arrive empty-handed, why not try something a little safer this year? Try this instead – make cherry pie bars. Cherry pie bars? Yes, they’re a thing. They’re delicious and perfectly preportioned. Dessert may not be your thing. Not all of us are bakers, after all. When sweets are not your thing and your must-have side dish is, well … a must-have, consider my favorite go-to small kitchen appliance – the slow cooker! Roll your eyes if you like, but when it comes to picking up and taking your holiday meals on the road, the slow cooker can be your best friend. Whether you’re in charge of snack foods (ever try Slow-Cooker Chex Party Mix?) or bringing your to-die-for creamy mashed potatoes (you won’t believe how easy Slow-Cooker Mashed Potatoes can be), you can do it all in your magical slow cooker. And, when you arrive, there’s no fighting over oven space – all you need is a little counter space and an outlet to keep things warm. Finally, if you have been given the seemingly daunting task of cranberry sauce, yes, you have the option of grabbing a couple cans off the shelf of whatever store you pass that is open on your way to dinner. But why do that when it’s so easy to make and it actually travels well? 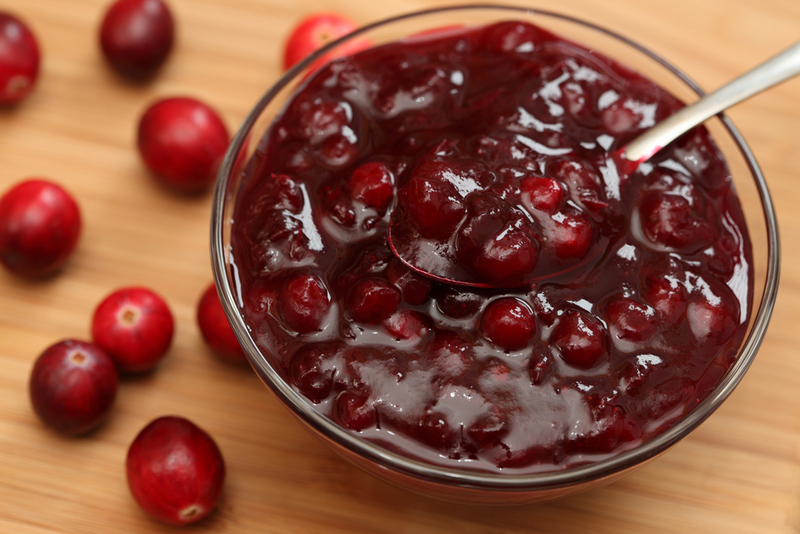 Below you will find my never-before-shared, never-fail cranberry sauce recipe. It’s easy and, by the way, you can double it and use it in place of the cherry pie filling in the Cherry Pie Bars recipe above! Zest the oranges into the pan you will use to cook the cranberry sauce. Then squeeze the oranges into a measuring cup. Add enough water to equal 1 cup of liquid. Pour into the pan with the orange zest and add the sugar. Cook on medium low, stirring constantly until the sugar is completely dissolved. Carefully add the berries and turn heat to low. Stir. When berries begin to pop, you’re almost there. Keep stirring until the berries cook down. The sauce will seem a bit syrup-y, but it will firm up as it cools.